SHN/APE: .st5 fingerprints posted in announce thread, should also be included with the show. Since SHN format is not capable of self-testing, some form of checksums must be included. FLAC: .st5/.ffp fingerprints posted in announce thread, should also be included with the show. DVD: .md5 checksums posted in announce thread and included with the show. .md5 wholefile checksum. verifies that files are identical in every single way, and is therefore sensitive to compression setting, file format et al. .st5 aka SHNtool md5. this is a checksum taken from the decompressed audio only. the advantage to this is that it works with any lossless codec at any compression setting. This is the preferred checksum type to be included with FLAC, SHN or APE files. .ffp aka FLAC fingerprints. These checksums are virtually identical to .st5. some differences are explained below, under "Verifying a checksum file" and "Creating a .ffp file". For audio, I highly recommend using FLAC and including .st5 and .ffp no wholefile .md5 necessary. This function runs a simple test to see if the files will decode properly. 2. Use Files of type to select the lossless file type. 3. Select all and hit open. 4. Check that the information displayed in the list is correct. 6. The result will take a few minutes to display. 2. Use Files of type to select checksum type. Load the checksum file. 4. This will take a few minutes. ffp compares the checksums in the FLAC header without checking the audio. .md5 checks for any change whatsoever in the whole file (useful for DVD). 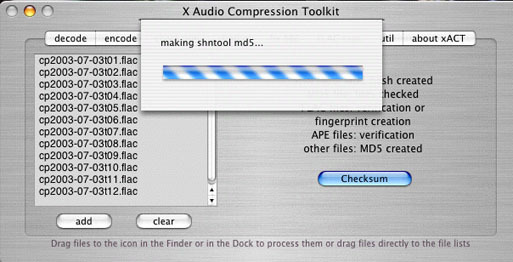 .st5 checks the decompressed audio only. md5 for DVD cannot find the files, what do I do? To verify a playable video DVD with checksums which are on your hd, generate md5 checksums (see below) directly from the DVD and then test those against the files which are on your hd. Be very careful not to alter the 32-digit checksums or filenames, just add "VIDEO_TS/" (no quotes) as above. If you wish you can substitute \ for /. The end result is a DVD which is playable in most standalones & also includes all the stuff which is normally included in a trade. Another big advantage is that you can double-click the .md5 which is inside the EXTRAS_TS folder and TLH will test all of the files on that DVD. Just be very careful that you get everything correct the same way I explained it above or it will not work. thanks to fatoldpig and yoho for suggesting this stuff! This gives some helpful details about the set's compatability with audio cdr format. This is primarily used to check for SBEs (Sector Boundary Errors), and that the files are 16bit/44.1kHz. 6. Copy and paste into your info .txt file. Test the files and run a len check before you do this. st5 is a new name for something known as a SHNtool md5. it is a checksum for verifying only decompressed audio from a lossless file. .st5 is identical to .ffp except formatting of the text. 4. The checksums will take a few minutes to calculate. 5. Save your .st5 to the same folder. 4. Since the ffp checksums were calculated during initial coding they can be very quickly extracted from the headers and put into a list. 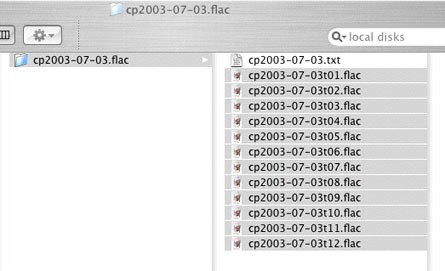 FLAC files should also be tested to make sure they can be decoded properly (see "Testing lossless files" above). 5. Save your .ffp to the same folder. ffp is generated by FLAC itself. during encoding a checksum is generated from the decoded audio only for each file and stored in the header. the checksums are the same as a .st5 (aka SHNtool md5) just the formatting of the .ffp is slightly different. .md5 checksums are only used for video at TTD. 1. Go to Create checksum file tab. 2. Press Browse. 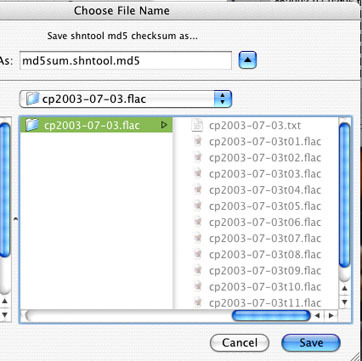 Select the folder containing the VIDEO_TS folder of the DVD you want to create checksums for. It is best not to select the VIDEO_TS folder, but instead the folder which contains the artwork, info and VIDEO_TS folder. 4. From the dropdown menu on the right, select md5 sig (default). 5. Review that the files and folder are all correct, then hit Create. 6. Save your .md5 to the folder which contains the artwork (if you have), info and VIDEO_TS folder and not inside the VIDEO_TS folder. In the example, you would want to save to a folder called 1971.09.09 Hampton. this is going to get put into the FAQ sometime soon. please let me know if you find any type-o's/fuckups! .st5 aka SHNtool md5. this is a checksum taken from the decompressed audio only. the advantage to this is that it works with any lossless codec at any compression setting. This is the preferred checksum type to be included with shn or ape files. For audio, I highly recommend using FLAC and including .st5 and .ffp no wholefile .md5 necessary. Except the 32-digit checksum is going to be exactly the same in the st5 and ffp file. There is really no reason to include both types of checksums for fingerprints, just one type. 1. Locate files on your computer. 2. Open xACT to the checksum tab and drag the files into the window. 3. Hit the Checksum button. 4. Hit the shntool md5 button (verify is the default). 5. It prompts you to save it somewhere, find the same folder. 7. It makes the shntool md5s (it will take a couple of minutes). 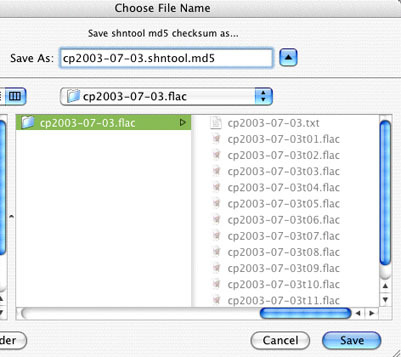 I added in "This is the preferred checksum type to be included with FLAC, SHN or APE files." in the st5 section. The main reason is that when you double-click a .ffp for testing using TLH, it extracts the checksums hidden in each FLAC file's header and compares that to what is in the .ffp file to see if it matches (takes about three seconds). Using the .ffp this way for testing does not test the audio content whatsoever (which could be corrupt after a successful .ffp verification). A second stage of testing is necessary in this case, it is "test" mode, which decompresses the audio to a temp file and generates a fresh hash from this and compares that to the the checksum hidden in the header. So, only after the two-stage test the files are verified. Double-clicking on a .st5 for verification using TLH results in the audio content of the files to be tested being decompressed to a temp file (temporarily) while a fresh hash is generated and compared to the corresponding checksums contained in the .st5 file. So the .st5 test is only one step and verifies both (a) that the files will decompress properly (as with "test" mode) and (b) that the checksums contained in the .st5 file match hashes freshly generated from that decompressed audio. When a .st5 verifies 100% okay everything is tested except the header isn't looked at, thus the .ffp. The .ffp is admittedly a little superfluous, but since it is only 1k and takes about three seconds to generate and verify its not really much to ask. so, to burn a data disc that is standalone compatable using the EXTRAS_TS method, would select your disc type as DVD-ROM (ISO), DVD-ROM (UDF), or DVD-ROM (ISO/UDF)? I installed cygwin on my Win XP machine and use scripts and command line stuff to do all my lossless operations. Much cleaner than dealing with GUIs for me. I never could get md5check running for some reason, but have heard it is really great, you just need a bit more of a grasp of commandline than I have! If somebody wants to post instructions for that it would be appreciated. Just use the default that Nero selects when you boot up, I believe that's "DVD-ROM (ISO)", the setting you would use for burning normal non-video stuff. It works great with my DVD player and it is sweet being able to get all the info & artwork right off the same playable disc. Also great to just double-click the md5 there and the DVD self-tests. On a Mac, when using Toast, if I want to add an EXTRAS_TS folder, I go to Data > DVD-ROM (UDF). ack... okay, maybe its DVD-ROM (UDF) on PC, too. it is the default when you start up Nero. My DVD burner is on my other computer, I can check it later and post back.